Jen'nan Ghazal Read is in the sociology department and global heath institute at Duke University. She is a Carnegie scholar studying the economic, political, and cultural integration of Muslim Americans and Arab Americans. Recent national polls find that four in 10 Americans have an unfavorable view of Islam, five in 10 believe Islam is more likely than other religions to encourage violence, and six in 10 believe Islam is very different from their own religion. All this despite the fact that seven in 10 admit they know very little about Islam. 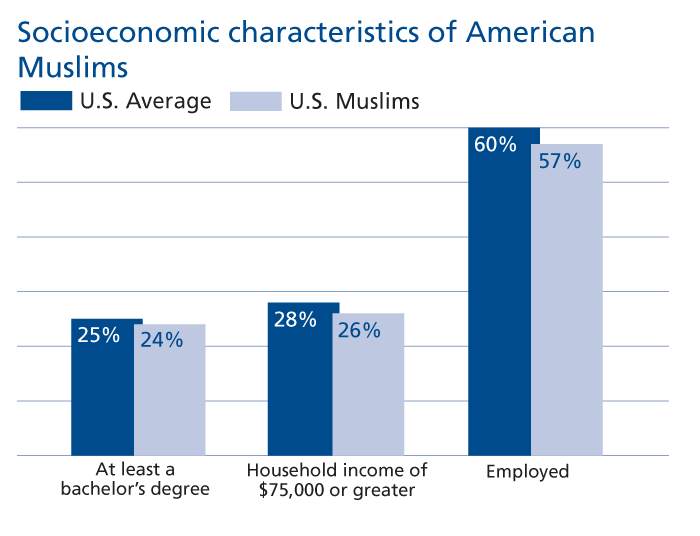 And yet Americans rank Muslims second only to atheists as a group that doesn’t share their vision of American society. These fears have had consequences. In 2001, the U.S. Department of Justice recorded a 1,600 percent increase in anti-Muslim hate crimes from the prior year, and these numbers rose 10 percent between 2005 and 2006. The Council on American-Islamic Relations processed 2,647 civil rights complaints in 2006, a 25 percent increase from the prior year and a 600 percent increase since 2000. The largest category involved complaints against U.S. government agencies (37 percent). 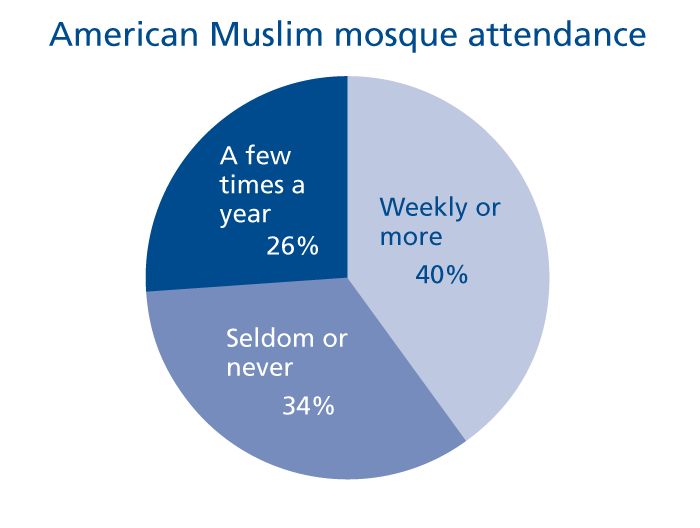 Clearly, many Americans are convinced Muslim Americans pose some kind of threat to American society. Two widespread assumptions fuel these fears. First, that there’s only one kind of Islam and one kind of Muslim, both characterized by violence and anti-democratic tendencies. Second, that being a Muslim is the most salient identity for Muslim Americans when it comes to their political attitudes and behaviors, that it trumps their social class position, national origin, racial/ethnic group membership, or gender—or worse, that it trumps their commitment to a secular democracy. In 2001, the U.S. Department of Justice recorded a 1,600 percent increase in anti-Muslim hate crimes from the prior year. Most complaints involved U.S. government agencies. Research on Muslim Americans themselves supports neither of these assumptions. 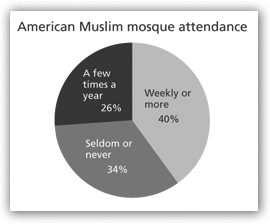 Interviews with 3,627 Muslim Americans in 2001 and 2004 by the Georgetown University Muslims in the American Public Square (MAPS) project and 1,050 Muslim Americans in 2007 by the Pew Research Center show that Muslim Americans are diverse, well-integrated, and largely mainstream in their attitudes, values, and behaviors. The data also show that being a Muslim is less important for politics than how Muslim you are, how much money you make, whether you’re an African-American Muslim or an Arab-American Muslim, and whether you’re a man or a woman. The notion that Muslims privilege their Muslim identity over their other interests and affiliations has been projected onto the group rather than emerged from the beliefs and practices of the group itself. It’s what sociologists call a social construction, and it’s one that has implications for how these Americans are included in the national dialog. Let’s start with who Muslim Americans really are. While size estimates of the population range anywhere from 2 million to 8 million, there is general agreement on the social and demographic characteristics of the community. Muslim Americans are the most ethnically diverse Muslim population in the world, originating from more than 80 countries on four continents. Contrary to popular belief, most are not Arab. Nearly one-third are South Asian, one-third are Arab, one-fifth are U.S.-born black Muslims (mainly converts), and a small but growing number are U.S.-born Anglo and Hispanic converts. Roughly two-thirds are immigrants to the United States, but an increasing segment is second- and third-generation, U.S.-born Americans. The vast majority of immigrants have lived in the United States for 10 or more years. Muslim Americans also tend to be highly educated, politically conscious, and fluent in English, all of which reflects the restrictive immigration policies that limit who gains admission into the United States. 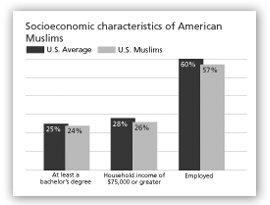 On average, in fact, Muslim Americans share similar socioeconomic characteristics with the general U.S. population: one-fourth has a bachelor’s degree or higher, one-fourth lives in households with incomes of $75,000 per year or more, and the majority are employed. However, some Muslims do live in poverty and have poor English language skills and few resources to improve their situations. One of the most important and overlooked facts about Muslim Americans is that they are not uniformly religious and devout. Some are religiously devout, some are religiously moderate, and some are non-practicing and secular, basically Muslim in name only, similar to a good proportion of U.S. Christians and Jews. Some attend a mosque on a weekly basis and pray every day, and others don’t engage in either practice. Even among the more religiously devout, there is a sharp distinction between being a good Muslim and being an Islamic extremist. None of this should be surprising. Many Muslim Americans emigrated from countries in the Middle East (now targeted in the war on terror) in order to practice—or not practice—their religion and politics more freely in the United States. And their religion is diverse. There is no monolithic Islam that all Muslims adhere to. Just as Christianity has many different theologies, denominations, and sects, so does Islam. And just like Christianity, these theologies, denominations, and sects are often in conflict and disagreement over how to interpret and practice the faith tradition. This diversity mimics other ethnic and immigrant groups in the United States. You know - facts and figures don't tell the whole story. What's in the minds of people - which they voice - speaks more. About 15 years ago, my father went into a convenience store in which the cashier was a woman with a scarf on her head. He asked her what religion she was. She responded that she was Muslim. He said, "You know, I've noticed a lot of your people in this country. Why is that so?" Her response - when I heard it - chilled me to the bone. She said, "We are here to teach you a better way." TEACH us? Considering that Muslims are not known for supporting the charitable work of others in this country and considering that they are not known for reaching out to Americans on a social or charitable level where they live, I can only infer from the woman's statement that they intend to impose their values on Americans. And those are better than our Judeo-Christian ones? A mosque was built in a community in my town. It was put in the midst of several Christian churches. The Muslims have never tried to get to know their neighbors, even though members of my church (Methodist) went to their church to say "hello". I am left with the conclusion that Muslims are immigrating to this country in order to build up their numbers. At which point, they intend to take over this country. If not by vote - then by force. I am terrified for the safety of this country and the continuity of our Constitution. I want Muslim immigration to this country halted. Now. An educated mind draws conclusions from objective observations, controlled experiments and reports on confirmed –not anecdotal- evidences. 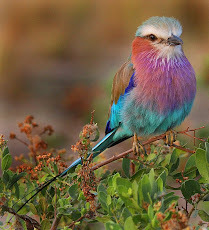 A primitive mind on the other hand, first arrives at a conclusion and than searches for supporting evidences which are, inevitably bound to be hand picked among a plethora of counter evidences. Mrs. Clarke, sadly, falls into the latter one. She, most probably having been bombarded by Islamophobic and xenophobic media, has already had her opinion on the subject matter and after an exhaustive search found the evidence in a distant past. I would try to show some empathy in a situation like the one she relates form his father. A young –admittedly a witty one- Muslim lady who most probably had been the target of similar verbal abuses and accusing stares, was asked “What the hell are you and people like you doing in this country?”. What would Mrs. Clarke feel if she was the one facing the question? How long would she be able to let it go with a smile? Does Mrs. Clarke understand what the hideous question really means? Does she understand that this country is based on the freedom for all faiths not only the one she believes in, freedom for all ethnical backgrounds not only the one she belongs to? Is Mrs. Clarke aware of the fact that if not her father, her grandfathers asked the African-Americans the very same question for very long time? And the Jewish immigrants, and the Polish immigrants, and so and so forth? We do not know what the witty Muslim lady really meant by her answer, but indeed it turned out that she was right. We do learn to better. Not necessarily because they are better but we are worse than we though for long time. Ask any person, anywhere he/she would tell you that he/she respects all cultures, faiths etc. until actually meets one. Americans were not any different. Today we are being tested how sincere we are and, sadly, we are not doing well. It is time to learn to be better. Either form our mistakes or the mistakes of old Europe. Or shining examples of 7-century peaceful co-existence (La Convivencia) in Spain or Ottoman era in Balkans and Asia minor. Incidentally both examples were lead by Muslims but this is beyond the point. The only pint I strongly agree with Mrs. Clarke is that the fellow American Muslims attending the mosque in her neighborhood should have been more engaging with their neighbors. Not only because it is natural and their religion commands that but also to remove the possible doubts in some minds with prejudice. I gladly observe the increasing dialogue with American Muslims and Americans from all other faith backgrounds which, I strongly believe, will lead more peaceful, more harmonious, more prosperous and more secure future. I only wish my fellow Americans to be more educated about the existence of a world beyond their counties. Than again, with the education system and the media we have, maybe I am asking for too much.